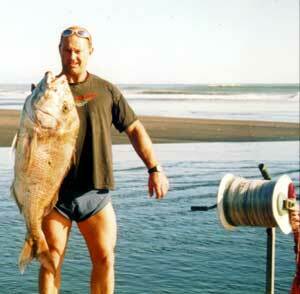 You may remember, last week we posted a report phoned in by Geoff Preston of his recent fishing trip at Mokau. The following is a letter and excellent photos from this particular trip. Here are a few of the photos from Geoff Preston fishing on a Thursday a week ago. 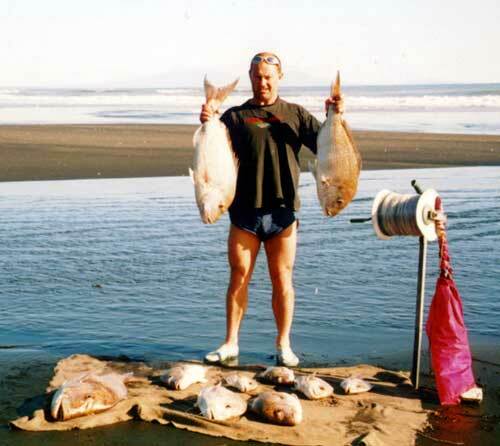 Below : Steve with two of his five to six kilogram fish, plus some of the others. My friend Steve McKewen, from Stratford, who is also a keen kite fisherman and I fished two kite rigs on the day. We had given a few of the snapper away by the time the photos were taken. Steve caught all of the snapper except the 12.12kg one and one of the smaller snapper. We caught plenty of gurnard as well. Even though the conditions were marginal on the following Sunday, a very light wind, I just managed to set with no weights and a small empty bottle. Trailing in the water were juicy squid legs and strips. 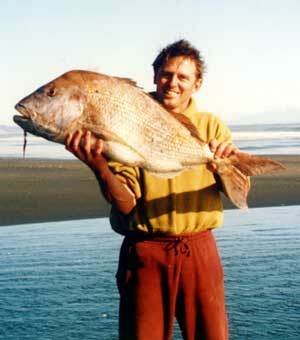 Above : Me holding my 12.12 kg prize snapper. Above : Steve holding the big snapper. Expecting a few kahawai, or nothing, I pulled in shortly after the kite went down to avoid any drift in the gear or any tangles. I caught one kahawai and, on the second to last hook, another big Mokau snapper. This snapper weighed in at 9.5kg and I was so surprised because it was the first one I've caught with no weights on the line. P.S. Also fishing beside us on the Thursday was Jim Vincent from New Plymouth. Jim was extremely pleased after landing his first nice snapper which would have gone around 5kg. Emma and I were fishing up at 90 mile beach on the 7th of August. We set 25 hooks out with trevally on our bottom longline rig and we got a good catch of 11 gurnard. It has been hard to find the snapper, but I am sure it won't be long and we will have some more pic's for you with some big snapper. 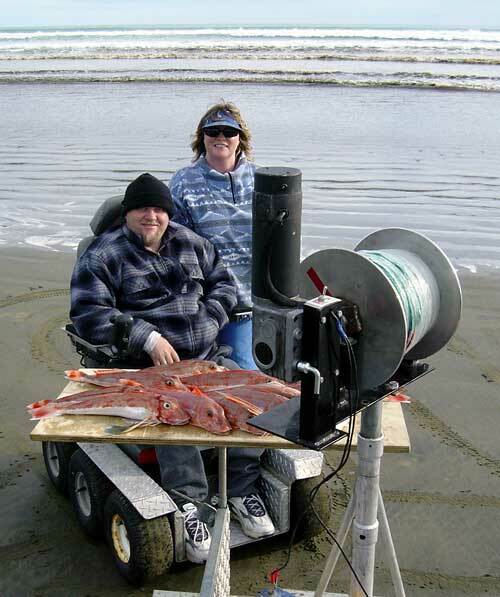 Pic above : A great photo of Kevin Griffiths with the gurnard, the winch he uses to haul his rig in and his six wheel drive beach capable wheelchair. I put out two sets with my dropper rig on Wednesday the 13th. With 18 hooks baited up with squid the gear headed dead straight offshore, it was a perfect set each time. The winds were a light northeast and I fished over the incoming tide. While I didn't catch any fish on this particular day, I still had a great day and thought I'd drop you line to tell you about the area I fish. Kariotahi Beach is on the west coast south of Auckland and about one hours drive from Auckland City. It extends from the South heads of the Manukau to the Waikato River mouth. The beach is accessed from Waiuku and is clearly sign posted. Generally the beach is hard packed sand with access possible by all vehicles although cars will not navigate it above half tide. The beach features very high almost mountainous hills behind it adding the option of some sturdy climbs resulting in fabulous views. Exposed to the west this beach generally exhibits rough surf conditions and if the forecast is for two metre swells or greater then the surge and rip will conspire to prevent effective sets. Kariotahi will yield great fishing in good conditions with medium to very large snapper, gurnard, terakihi and many other species, including elephant fish which I believe are very much underrated by northerners. Gummy sharks or rig, which are possibly the best frying fish when they are fresh and are handled well, are also available here. The features of Kariotahi are its accessibility and it proximity to the Southern Auckland suburbs. Kariotahi is well used, probably the most fished beach in New Zealand, and often finding room to launch a serious kite assault can be difficult. An additional hazard close to the access are the number of drivers who want to show off their driving skills, or lack of them, in stolen cars. Nevertheless, Kariotahi Beach offers a wide range of fishing options from the rocks at the northern end to the fresh water river mouth at the south. Be ready to move a bit if your first set is unsuccessful. Sometimes just moving a hundred yards up or down the beach can make all the difference. The beach is generally snag free but sets should be limited to about 20 minutes as the sharks are all starving. Dropper rigs are definetly the way to go at Kariotahi Beach. Ed : Thanks for the great beach report, I will put it with a map in the area section of the site when time allows. Iain MacDonald was in at the shop just a couple of days ago and reported that he was fishing Kariotahi Beach on Sunday, the 10th of August. Iain was using a large dropper rig baited up with mullet and ran three sets for one gurnard, two kahawai, and one excellent 16lb snapper. Last Sunday, during the strong easterly winds, Lloyd headed out to Muriwai with his bottom longline rig. Baiting up with mullet he set 22 hooks through a high surf during the incoming tide. With quite a strong rip running, the gear set at around 45 degrees offshore. Lloyd caught two large kahawai, lost one very big kahawai when pulling the line back in, and surprisingly, also managed to catch one flounder by hand in the surf. Lloyd believes the flounder must have been following the baits back ashore. I set my kontiki rig out on the 7th of August from Snells Beach, Opotiki. Snells Beach is just out of Opotiki on the way down to Te Kaha. The kontiki ran out to about 1200 metres offshore, dead straight out, and I left it for around one hour. A bad westerly rip was present and the gear drifted about 200 metres down the beach, but as I was the only one to catch anything I think the drift might have actually been beneficial. I wound up with six gurnard and one snapper from 14 hooks set which I had baited with mackerel. There was a flexiwing rig,a bag and another kontiki also on the beach, but neither of them had any luck.